GSP v Khabib: Georges St-Pierre reveals attempts to book UFC fight with Nurmagomedov Get short URL Canadian UFC legend Georges St-Pierre has revealed that his representatives have been trying to negotiate a fight with lightweight champion Khabib Nurmagomedov. St-Pierre captured UFC world titles at both welterweight and middleweight, and says he would relish the opportunity to test himself against the undefeated UFC lightweight champion to see if he could be the first man to defeat "The Eagle," who has dominated the opposition inside the octagon so far in his career. Speaking at an event at the Canadian Museum of History, St-Pierre revealed his representatives have been trying to get him a fight with Nurmagomedov, but have so far turned up a blank. "It's been a few months that my agents are in communication with the UFC to try to make a fight happen," he explained. "It was against Khabib Nurmagomedov. "I know Khabib wanted to fight me and I wanted to fight him. It's not about feeling, it's just about respect, and for me as an athlete, what drives me the most – what is the most exciting for an athlete in combat sports – is to be able to beat someone who seems invincible. "That's the scariest thing to do, but it's also the most exciting thing to do [and] at the point that I am at in my career, to keep my motivation high, that's what I'm targeting." St-Pierre, who hasn't lost a fight since Nurmagomedov started his undefeated MMA career, said he rates the Russian superstar as the best fighter on the planet, and revealed that he would love to test himself against him inside the octagon, calling him "a real good problem to solve." "Khabib, for me, right now he is the best fighter in the world. He's undefeated," he said. "When you see him fight, he's incredible. He wins every round. Nobody has ever even found a weakness in him. So he's a real good problem to solve. "For me, as a fighter, that's the most exciting thing." Despite suggesting that both sides of the bout were open to the potential matchup, it seems the UFC may not be so keen. Former undisputed welterweight world champion St-Pierre ended a four-year hiatus from the sport when he returned at UFC 217 to challenge UFC middleweight champion Michael Bisping at Madison Square Garden. 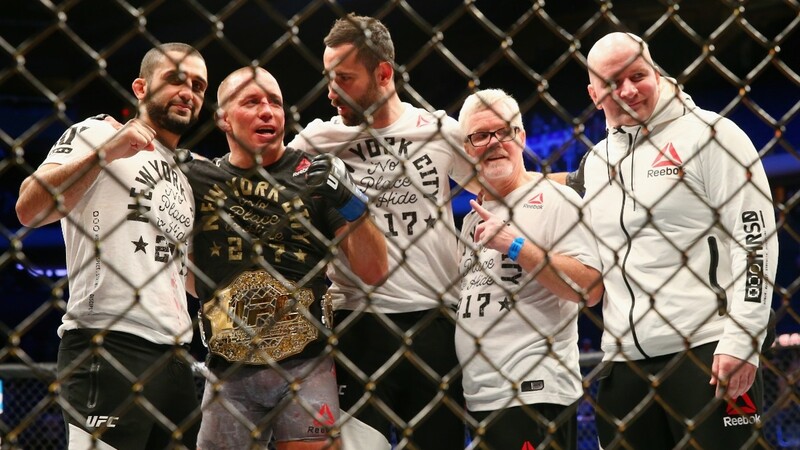 St-Pierre submitted the Brit in the third round to capture the middleweight title, but immediately relinquished the belt, angering UFC officials in the process. And it is believed that UFC officials may not be interested in putting St-Pierre in a position to potentially do something similar with the lightweight title. It's a position St-Pierre appreciates and understands, as he explained. "UFC is a business at the other end, and they know I'm 37 years old and I'm at the end of my career," he said. "Khabib is younger, he has a lot of fights ahead of him, and he provides a great future for the UFC. "I'm sure for the UFC from a business standpoint they want to keep him there [at the top] and I understand, you know? Instead of taking a risk and putting him against a guy like me. St-Pierre's willingness to face Nurmagomedov echoes his views as told to RT Sport two years ago, when he said a potential matchup between the pair would be "crazy". "The way my body is made, I could make 155," he told us in 2017. "It would be a tough cut, because I normally walk around at 188lbs. I know a lot of guys, and I think Khabib is about the same size as me, or maybe even bigger than me." 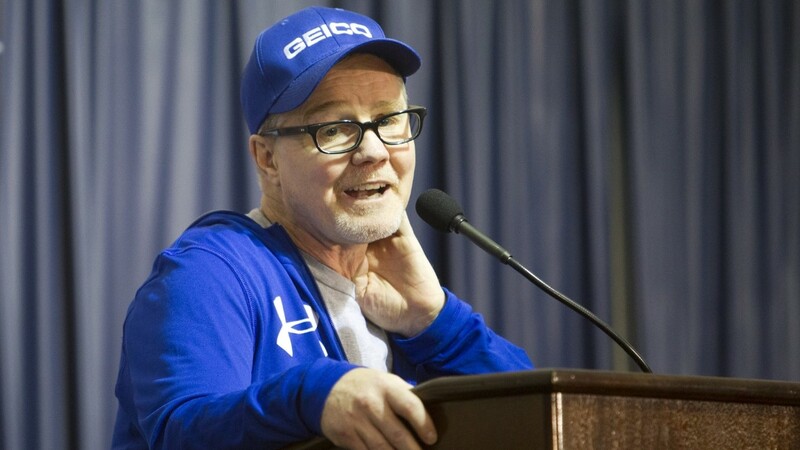 While St-Pierre revealed his team's pursuit of a bout with Nurmagomedov, another member of his camp, boxing coach Freddie Roach, said the Canadian was training hard in preparation for a fight with a different opponent – Conor McGregor. "I think one more [fight]. Just one," Roach told the Below the Belt podcast. "The Irish boy. He's got a big mouth. We'll make the weight. Georges is on a new diet. It's doing really great." Roach said that after St-Pierre moved up from welterweight to middleweight to win the title, the aim now is to drop from welterweight to lightweight and win in that weight class, too. "We wanted to prove that we could go up in the higher weight division, and we did that," he said. "Then Dana got mad that we dropped that title. We want to go the lower weight now and be a three-time world champion, three weight divisions." Of course, McGregor is no longer the UFC lightweight world champion, but whether St-Pierre comes back against Nurmagomedov or McGregor, the Canadian's potential comeback would certainly draw a huge pay-per-view audience.